Rock And Roll Lunch At Hard Rock Cafe is an event that took place between 01-May-2011 and 31-May-2011 in Hyderabad. For those who believe pub lunches ought to rock, and for those who believe that they do anyway, Hard Rock Cafe doesn't look like it's lowering expectations any time soon. Lunch in an ambience of musical bonhomie, at the Hard Rock Cafe, at its Rock & Roll spread all month. The lunch starts with a choice of vegetarian or non-vegetarian soup of the day, to whet your appetite, and for good reason. The non-vegetarian platter will have Chicken Cheese Burger, Chicken Sandwich, Caesar Salad and Chicken Curry, accompanied by a portion of rice. The vegetarian array will consist of a Vegetarian Burger, a Vegetarian Sandwich, Paneer Wrap, Pasta Arabiatta and Paneer Curry, accompanied by a small portion of rice. Add 75 bucks more, and you can choose another delectable addition to your lunch - from a choice of Grilled Chicken, Legendary 10-ounce Burger, Twisted Mc Chicken, Twisted Mac and Cottage Cheese, and Fish Curry. A scoop of ice-cream brings the perfect finale to this food-music jugalbandi. The buffet is priced at Rs. 295. Please call 4476-7900 for further details. 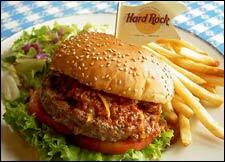 Be the first to comment on Rock And Roll Lunch At Hard Rock Cafe! Just use the simple form below. fullhyd.com has 700,000+ monthly visits. Tell Hyderabad what you feel about Rock And Roll Lunch At Hard Rock Cafe!